The time of the rapture is exegetically indeterminable. Hence, if it is to be known it must be deduced. As such the timing of this event can only be arrived at by way of inference to the best explanation (i.e. the best rapture scenarios will be C3). The 70th Week of Daniel is seven years long and commences with “the prince who is to come” making a covenant with Israel. This period is divided in half by the breaking of the covenant. The 70th Week has Israel in mind, not the Church. The white horse rider who appears at the beginning of what I take to be the seven year period is the Antichrist. In light of the Day of the Lord in 2 Thessalonians 2 not coming until “the apostasy” and the revealing of the man of lawlessness/sin (2:3), the rapture seems to take place at the start of the seventieth week (although 2 Thess. 2:4 could be interpreted in a mid-trib fashion). The concept of the Day of the Lord and its attendant images (e.g. “birth pangs”) are not technical terms which can be restricted to one event. However, the Battle of Armageddon is strongly connected with it. In the Book of Revelation the Day of the Lord is associated with the Second Advent of Christ in wrath. I have asserted that the future Tribulation is seven years long mainly on the strength of equating it with the Seventieth Week. I have also assumed that the first seal in Revelation 6 signals the start of the Seventieth Week. Although it is evident that what is often called the “Great Tribulation” begins when the Antichrist “takes his seat in the temple of God, displaying himself as being God,” (2 Thess. 2:4)—that is, the last three and a half years—yet the advent of the “Four Horsemen” of Revelation 6 shows that the whole Seventieth Week may be rightly called “the Tribulation” (cf. Matt.24:8). It is a time distinct from now (after “the times of the Gentiles”—Rom. 11:25), when God turns again to deal with Israel. There is scarcely any reason for a seven year final determination on Israel if only three and a half of those years are adverse. Certainly the troubles depicted in Revelation 6:3-8, troubles reminiscent of those visited upon Israel by the Lord in Jeremiah 14 (when God instructs the prophet not to pray for them—Jer. 14:11), constitute tribulation. 2 Thessalonians 2:1-3 is a crucial text for the Prewrath position, and it surely should be admitted that one cannot cavalierly state that the protos (“first”), in “for that Day will not come unless there be a falling away first,” inevitably signals a pretrib rapture. It does not. I have been at pains in this series to show that the best educated guess at the timing of the rapture will be a deduction from various premises. Hence, although I am a pretribulationist, my reasons for being one come about through the way I arrange the different pieces of biblical data into a coherent picture. Much the same holds true for the New Testament writers. So the thing to be determined is whether the usage of the phrase within an End Times context can be given this restricted nuance. In the essay on “The Day of the Lord” already referred to, Paul House uses the book of Lamentations to notice that, at least there, the concepts of divine wrath and the Day of the Lord are combined. The second chapter of Lamentations begins with “the day of His [God’s] anger” (Lam. 2:1). What follows reveals the object of God’s wrath and its extent. Lamentations 2:22 calls this time of calamity which Jeremiah is witnessing, “the day of the Lord’s anger.” House believes Lamentations shows the Day of the Lord to be “nothing less than a report on the Day of the Lord from those who have experienced it in space and time” (Central Themes in Biblical Theology, 203). In pointing to the overthrow of Jerusalem as an example of the Day of the Lord, House is not denying that another greater Day will come at the end of the age. What he is saying is that the Day of the Lord is wrath in many cases. Although the phrase “Day of the Lord” does not occur in Lamentations as it does, say, in Joel or Amos or Isaiah, House argues that the concept seems to pervade Lamentations. If he is right then we should notice that saints are present in this instance of the Day of the Lord. We have already seen that Christ’s Second Coming is in wrath (Rev. 19:16). Very well, the Day of the Lord in the end of the age can and does mean Divine wrath. But does it also mean the whole Seventieth Week, or the last half of it, or can it be confined within the limits of the bowls of wrath in Revelation 16? Let me say first of all that as we have already made a solid case (or so I think) for connecting divine wrath with the Return of Jesus in Revelation 19 (cf. 2 Thess. 1), I have to say that I find it very hard to conceive of the bowls of wrath as the sole meaning of “wrath” in the book, or in other NT eschatological passages. The truth is, the Day of the Lord is a name for particular times when God acts in judgment (sometimes in view of a saving purpose). The judgment may come directly from God, as with the coming of Christ (cf. Isa. 63; Lk. 21:22; 2 Thess. 1:8); or it may come via a secondary agent, as in the first occurrence of the term in Amos 5, where the last verse links it with being taken into captivity. The Day of the Lord may refer to the events surrounding the final battle and the return of Christ to earth, as it surely does in Zechariah 14:1-4. It cannot be confined the way prewrath advocates wish it to be. The Church in the Tribulation? The Antichrist pursues “the saints of the most High” who are not the Church (Dan. 7:25; cf. Rev. 12:6-7). The “elect” of Matthew 24:22 are Israel, not the Church. The Church is not settled in Judea (24:16), does not ordinarily have “housetops” (24:17), and does not keep the Sabbath (24:20). 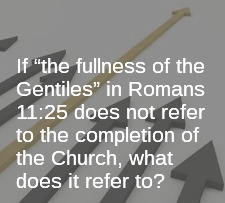 Furthermore, if “the fullness of the Gentiles” in Romans 11:25 does not refer to the completion of the Church, what does it refer to? Post-tribbers would claim that the onus of God’s saving ecclesial operations turns briefly to Jews, but that is insufficient to explain passages like Jeremiah 30:6, Daniel 12:1 and others we have mentioned. If someone takes the mark, they are doomed (Rev. 14:11; 19:20). What would prevent a Christian under great duress from taking the mark? Worldly Christians today have a hard time discerning a heretic from a true teacher. Do we all suddenly develop mature spiritual discernment for the Tribulation? Also, no distinction is made between born-again saints and unsaved sinners in Revelation 16:2 (upon whom the first bowl of wrath is poured out). I just don’t see it. I appreciate the candor on this. I'm among those who believe that the case for conclusion A is actually stronger (over time) if we do not exaggerate the evidence or claim an inappropriate degree of certainty. Since Paul brings up the Pre-Wrath position I have always been fascinated with this section in Revelation. I noted it again while preparing a Palm Sunday sermon (or should it be Palm Monday???) as Rev 7:9 mentions the believers having palm branches. Anyway, after the initial discussion of Rev 6 with the 6 seals being opened (which matches with Matt 24), things roll into Rev 7 with a warning to not harm the Earth until the 144,000 are sealed. This indicates God's wrath has not been dealt out yet (the unbelievers are preparing for it in Rev 6:17 but it hasn't started yet). The logic for this is Satan and his minions can kill and harm people, but they don't really control nature like God does. When God's wrath starts, natures goes haywire as you see in Rev 8 for example. So then the tribulation in Rev 6 is Satan and the Anti-Christ against Christians mostly, but also people in general. In verse 9-17 is states that there is then a great multitude in heaven from all of the earth who are coming out of a great tribulation. To make a long story short, this really strikes me as a better rapture verse connection then claiming Rev 4:1. I would not see Rev. 7 as a chronological follow-on to chapter 6. My reason for this is because I think chapter 6 takes us through the whole year Tribulation period (as I stated in a previous part). The trumpets which begin in chapter 8 I see as kicking in about 2 to 3 years in to the Tribulation. Thus, I see a telescopic unfolding of the three 'vehicles' of the Tribulation: Seals - Yrs 1 to 7; Trumpets - Yrs c.3 to 7; Bowls - c. Yrs 6-7. This is because of the intensity of the plagues; especially the bowls of wrath. Also, I have made quite a big deal about the problem (as I see it) of having God dealing with the Church and national Israel at the same time. So I would not agree that Christians are in view in Rev. 6 - 18(+). Finally, Rev. 4:1 is too conjectural to be a rapture verse.